In engineering stress analysis, the question is often asked ‘What is the component’s strength?’, and in particular, ’What is the value of the material strength’? For the case of steels and most metals, the stress-strain behaviour is well known and the concepts of ‘Yield’ and ‘Ultimate Tensile Strength’ (UTS) are well understood and widely utilised. However, a topic still attracting attention is that of the value of ‘strength’ and its dependence on the method of measurement: in particular, whether the value is determined from direct tensile testing or from bending tests, often referred to as ‘modulus of rupture’ (or MOR) tests. This is the kernel of this month’s Technical Tip. For a particular material, the flexural strength would exhibit the same value as the tensile strength, if the material was homogeneous and isotropic. In practice, however, the material contains flaws or defects, even on a microscopic scale, which can cause localised stress concentration or weaknesses. 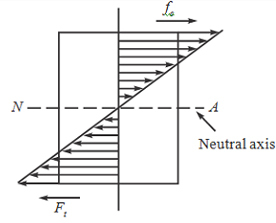 In bending, the outermost ‘fibres’ of the loaded material would experience the largest stresses, but these would be applicable only for a relatively small region on the very surface of the component and would decrease linearly towards the centre of the sample/component (neutral axis) to become a compressive stress (in bending), on the opposite side as shown in the figure. In pure tensile loading, however, this high (yield) stress is developed across the whole plane normal to the applied tensile load direction. Thus the region of material approaching yield is very much larger than that of the localised region on the surface of a specimen loaded in bending. The probability of the occurrence of a flaw is very much higher in the bigger region of material that is stressed in pure tension than it is in bending. In view of this, the initiation of the yielding process in bending occurs in a smaller region than in pure tension, implies a higher measured ‘strength’ in bending than in tension. The phenomenon is well described by means of a Weibull distribution of the flaws or imperfections. As mentioned above, however, if the material is defect free, and homogeneous and isotropic, then there is no flaw distribution difference and the measured strength in tension and bending are effectively equivalent. The implication is thus related to the cleanliness and isotropy of the material. In very clean, defect-free metals there is only a small difference between bending and tensile measured strengths, whereas in materials with flaw inclusions and orientation effects the difference in the strength as measured using bending and tension, would be more significant. The implication for the engineering user is to know more about the cleanliness of the material and its inherent defect distribution. In many well produced (defect-free) metals and steels the ‘difference ratio’ between bend and tensile strength can be close to unity. However, for many polymeric materials, the flexural strength is typically 1.5 times the tensile strength. Similarly, for some composite materials (for example glass fibre reinforced concrete) the difference ratio is between 1.3 and 1.4 times. For practising engineers and designers, be aware of the material behaviour and the apparent strength difference as a function of the mode of loading (tensile versus bending) and take it into your assessment considerations!